Written and field-tested by practicing consultants, The Consultant's Tool Kit will save consultants both time and money-as it makes their work with clients much more effective. Each tool or activity is designed to solve a common consulting problem. Reproducible worksheets, exercises, and questionnaires are easily downloaded from the web and customized by consultants to fit the exact needs of each client-;and help them effectively implement the solutions. This collection of field-tested tools, customizable questionnaires, and techniques for working with clients provides crucial problem-solving help in areas such as: Managing and leading change Organizational initiatives Assessing team and organizational functioning Improving relationships between departments and business units Creative problem-solving techniques Mel Silberman, Ph.D., (Princeton, NJ) is a best-selling author and editor. A professor of adult and organization development at Temple University, he is the author of Active Training. READY-MADE, HIGH-QUALITY CONSULTING TOOLS THAT HELP YOU HELP YOUR CLIENTS! Consultants need help too! Consulting is a demanding profession and today’s busier-than-ever consultant needs intelligent tools and resources to speed up and improve the process of working with clients. 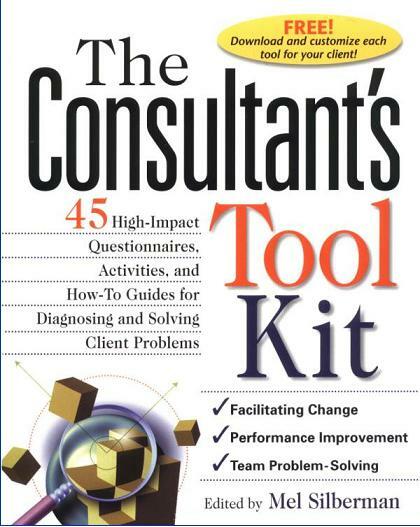 Help is now here in The Consultant’s ToolKit, an indispensable collection of 50 sophisticated team and organizational assessment questionnaires, team problem-solving activities, and how-to guides for diagnosing and solving client problems. Whatever the challenges facing you as a consultant—from showing your clients how to manage and lead change, to improving relationships between departments, to goal setting and planning—this book provides dozens of client-tested problem-solving tools and solutions that can be used immediately, saving you hours of time and making your interaction with clients more effective. Created by 50 top professionals in the consulting industry, all the tools in this sourcebook are fully reproducible and can be easily customized to fit your client's needs. Included are creative, ready-to-implement approaches to guiding a client in: *Finding the right business strategy *Making meetings more productive *Creating effective teams *Involving people in decisions that affect them *Coaching employees through change *Identifying performance problems *Dealing with management resistance *Stimulating creative thinking… *And much more! Dr. Mel Silberman is the author of Active Training and other organization development and training books. Professor of Adult and Organizational Development at Temple University, he is the editor of the annual Team and Organization Development Sourcebook, and The Training and Performance Sourcebook Annual. He has been a consultant to hundreds of corporate, governmental, educational, and human-service organizations, and is a popular presenter at professional conferences. Dr. Mel Silberman (Princeton, NJ) is a best-selling author of training and development books and professor of adult and organizational development at Temple University.